Thanks to digital identification, none of the parts equipped with RFID chips can be confused during assembly. Production and logistics are impossible to consider separately. In the course of the automation and digitisation of the supply chain and value-added chains, intralogistics plays an especially important role. In Saxony-Anhalt, business and science are working closely together to develop application-oriented solutions and effective support systems for the Industry 4.0. Planning a new factory is complicated but transforming an existing one is even more complicated. Therefore, before the business owners or investors can tackle projects of this kind, a virtual test run is completed and verified on the screen to make sure that everything is in order and works. This has been made possible by a software package created by the Magdeburg firm Tarakos GmbH. For almost 20 years, this company has developed and marketed programs for the virtual planning, simulation and visualisation of complex manufacturing processes – 3D software as a support system for Industry 4.0. "We are the specialists when it comes to dynamic 3D presentations for the planning, animation and simulation of logistics-, production and material flow facilities," explains Managing Director Herbert Beesten. With the "modular systems" from Tarakos, logistics centres and warehouses, production lines and assembly lines can be modelled on the computer in a fully virtually explorable format. The users have a library of around 500 parameterizable industry-specific objects at their disposal, with static systems such as walls, pillars or shelving systems and movable materials such as conveyor belts, forklifts, driverless transport systems, robots and, of course, people. Users can also drag and drop the objects into the scenario and position them there. The crowning glory is a video in which the planned processes are run through on a simulated basis. Both a full-scale normal view and a bird's eye view are possible. "It is virtual, but realistic and in real time," enthuses Beesten. "It is the perfect link between the physical world and the digital world of logistics." The software company has its headquarters in a granary which has been converted into a "think tank" in the former Magdeburg trading port, which is set to be transformed into a science port that will be home to innovative companies and research institutes. Nearby is also the “magnet” that originally drew 64-year-old all the way from Münster in Westphalia to Magdeburg: the Fraunhofer Institute for Factory Operation and Automation, IFF. As ever, the links between the IFF and the university remain close. The university offers one of just two degree courses in Computer Visualisation in Germany. Two of its graduates are now working for Tarakos. All in all, the company has 15 employees. Among the customers are many contract logistics professionals, says Beesten: "They need the program to show their customers that the system works and so they can convince themselves that there is actually enough space for forklifts trucks to get around every corner." With the 3D Oculus Rift glasses, the user can virtually enter the scene and walk around in it. Touch-grip sensors on the wrists allow the user to transport, stack or pick packages and components there. Recently, it has also become possible to assign sounds to the vehicles, machines and people. "You can hear when a vehicle is approaching, for instance, from the rear and to the right for example, and get out of its way," explains Beesten. "But don’t worry if you don’t manage it, it doesn’t matter. The collision is only virtual and doesn’t have to be reported as an occupational accident to the health and safety association,” he jokes. The main users of the Tarakos software are logistics professionals, material flow- and production planners. "These people aren’t programmers or 3D experts. That's why our software isn’t a high-end application for specialists. It is cost-effective, easy to use, can run on any conventional computer and can be easily integrated into the existing IT architecture.” Among the customers are providers of logistics services (Kühne & Nagel, Hermes, UPS), manufacturers of conveyor technology (Knapp Systemintegration, SSI Schaefer Noell), manufacturing companies (VW, Porsche, BMW and Daimler, Nestlé and the machine tool maker Trumpf), planning and consulting firms, 120 colleges and also some vocational schools. "We do business worldwide," reports Beesten. And foreign business now accounts for 30 percent of the company’s sales, a figure which is increasing all the time. "Logistics/production planning is a narrow sector, however, and as a small company our marketing power isn’t especially big. That's why we are currently looking around for a strategic partner who will act as a sales partner or an investor." 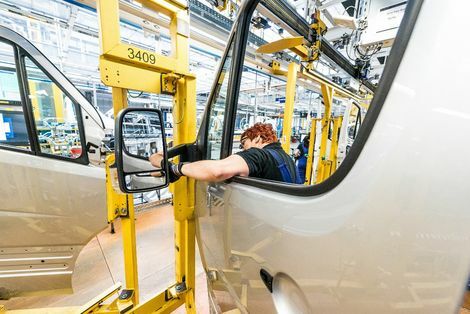 In a research project with Mercedes-Benz Ludwigsfelde GmbH at the commercial vehicles plant in Ludwigsfelde near Berlin, scientists at the Fraunhofer Institute for Factory Operation and Automation IFF (Magdeburg) have been analysing real production processes. Together with the "intelligent production" team at the plant, a team led by the industrial engineer Marc Kujath from the IFF department for Logistics and Factory Systems has been given the task of making the logistics and production processes at the car manufacturer more transparent. It’s something that anyone who has ever ordered a new car, knows: these days, the variety on offer is almost infinite. For the area of production, such a degree of customisation means that many components are all but visually indistinguishable for the workers. Most of them, and the safety-related components in particular, are therefore equipped with a barcode on which the serial number is stored by the manufacturer. The process to check whether the right component has been fitted in the right place is completed individually on a part-by-part basis with a handheld scanner – at least it was until now. This is because together with Mercedes-Benz Ludwigsfelde GmbH, the Fraunhofer researchers have brought a solution which is based on RFID wireless technology into use – and one which creates added value. Initially, around 40 possible parts were identified for the analysis in the factory and wing mirrors and seats were ultimately selected for the pilot phase. After extensive radio tests, the components were then provided with RFID transponders known as "tags". Unlike the barcode, the tag, which resembles a price tag, not only stores the type of mirror that it is, it also states the vehicle in which the mirror is to be installed, who the supplier is or a variety of other information. And while each barcode has to be read out individually with a handheld scanner, these tags can be logged on a contact-free basis using a reader, even in large quantities, all at the same time and at lightning speed. "Bulk detection of this kind typically takes place during the provision of the materials, i.e. the transition from logistics to production," explains Kujath. "The forklift picks up the pallet from the HGV and passes an RFID gate that reads the entire delivery batch in a matter of seconds – fully automatically and all at once." With the RFID tags it is possible to retrieve the information at any time especially also when the parts have already been installed. "This is a considerable advantage for production divisions," explains Kujath: "When assembling the front or rear axle or components in the engine compartment, interim checks can be made to see whether all of the required components have actually been installed." So far, this crucial form of object allocation has only become completed during the final inspection – "Traditionally by people, by visual inspection and by ticking off a list on a clipboard. But the 'digital checklist' is more efficient," he concludes. "It is less error-prone and more cost-effective and it relieves employees of routine work, but the automatic test provides them with the security of having the installed correct components." As a result of this, the RFID tags on the components not only enable a clear increase in the process reliability and efficiency to be achieved, they also significantly increase the transparency of the production process, explains Kujath. In a further step, serial tests are now underway with the goal of initiating a gradual transfer of the technology to the production process. Together with the project partner, the scientists are presently developing an application-oriented qualification concept with an interactive training demonstrator. The project originated from the "Industry 4.0 CheckUp" for companies which was developed at the Fraunhofer IFF. In this respect, the digitisation potential of the respective company is systematically analysed. It is then determined as to whether the integration of Industry 4.0 technologies into the process chain is appropriate – because it adds value – or not, and the specific measures which are available. The Institute Director of the Fraunhofer IFF, Professor Michael Schenk, summarised things as follows: "The digitisation of the world of production and logistics is the future. There are no off-the-shelf 4.0 solutions, just individual ones." Even if the hype about RFID technology is over, it is still far from being "uncool". On the contrary, in the age of Industry 4.0, its use in the area of production and logistics is growing rapidly, because RFID tags allow many products and equipment to be transformed into intelligent or even communication-capable information carriers within the logistics chain. Transport pallets, for example. These hard-wearing, versatile batch carriers are supposed to be what the world of marketing refers to as a "low interest product". In the world of logistics, however, they are considered "high potentials" – because they are ideally suited to collecting data and information: they travel through the supply chain for a long time, travel far and wide, and perform a wide range of storage and transport tasks. This means that they can be used at an exceptional variety of stopping points in the transport and logistics chain to gather information – for incoming and outgoing goods, during production processes, during the order picking and also for tracking consignments – and therefore provide data and valuable knowledge in real time. And since pallets are circulated millions of times, they have the potential to offer an extremely wide and detailed knowledge database. Together with the pallet manufacturer CABKA_IPS, the material flow technology experts at the IFF have therefore developed a system for the implementation of RFID tags on reusable plastic pallets. They are more economical than the ones that are made of wood, explains Professor Klaus Richter, Head of the Department for Material Handling Technology and Systems at the IFF. They are durable and long-lived, they’re also hygienic, can be handled far more often, and can also be used in automated environments such as high-bay warehouses. Their extra price compared with a wooden pallet is worthwhile. Unfortunately, however, they are also frequently misappropriated. "You have to be careful that they don’t go astray," explains Industrial Engineer Olaf Poenicke, who is part of Richter's team. "The grey market for them is very big." It therefore makes sense to provide high quality pallets with transponders – which are usually glued into the pallet base – to therefore make the pallet clearly identifiable. Within their "pool", i.e. the pallet exchange system in which they circulate, they can then be easily tracked, located and "captured" once again. At one major discount retailer, more than 1.5 million RFID pallets are already in use. In a new project, CAPKA_IPS, the researchers from the IFF and additional partners from the world of industry are working at the next level, namely equipping the pallets with sensors. This could result in a variety of benefits in terms of the digitisation and networking of production and logistics and mean further advancement towards the Internet of Things (IoT). “These IoT pallets are of interest for all goods which require a special level of monitoring,” explains Poenicke. That includes temperature-sensitive foods, medical products or precision mechanical machine parts which aren’t able to tolerate shocks, for example. With the sensors, or the existing sensor nodes which consist of several sensor nodes, it would be possible to monitor environmental data such as temperature and humidity on a continuous basis, with such data being collected automatically and transmitted in real-time. In this way, critical values and errors could be detected at an early stage and damage could be prevented. Users could then access the data at any time from mobile devices such as smartphones, tablets or even smart watches. Such a web-based analysis of increasing volumes of available information allows users to operate exceptionally long and complex value chains considerably more efficiently and transparently than before. The sensor boards are still priced in the two figure Euro price range, explains Poenicke: "But the computing technology is becoming more compact, more energy-efficient and more reasonably priced." This would make it interesting for an increasing number of users, would could integrate the new possibilities in their everyday logistics processes and benefit accordingly. HERE is where advanced progess comes into play. The start-up IM&P uses artificial intelligence in industrial maintenance and control – with an entirely new approach.